Looking at the cost of owning a truck, the annual cost of fuel for your vehicle should be an important factor in deciding which make and model you will drive. Below, read the comparison for different car manufacturers. First, we consider the American-made truck which has been around the longest—the Ford. Ford has many different models of trucks however here we will focus on the F-series. More specifically, we will look at the highly common F150. This truck has been in production since 1948.and is succeeded by the Ford Super Series. The Ford F150 has been the best selling vehicle in the United States for 32 years and the best selling pick-up truck in the United States for 43 years. Is the Ford F150 so loved because of it’s terrific fuel economy or is it some other quality that attracts its millions of buyers? Let’s take a look. The most current model of the Ford F150 is quoted at receiving up to 17 Miles Per Gallon in the city and 23 Miles Per Gallon on the highway. Next, we’ll take a look at a more-recent model design which has been in production since 1999—the Chevrolet Silverado. It is a front-engine full pick-up with four different body style options available. You can purchase the vehicle in both standard and automatic and have a choice between four engines, two of which are V6’s and two of which are V8’s. For our comparison of fuel economy, we will take a look at all of the different Chevy Silverado Engines to see if engine size does, in fact, effect the gas mileage you’re able to achieve. In the V6 Chevy Silverado, there is an average of 17 Miles Per Gallon achieved where in the V8 Chevy Silverado there is an average of 14 Miles Per Gallon achieved. When looking at the difference in fuel economy it is important to consider that when the size of the engine increased, the power and torque increased as well. While you are losing out on MPG’s, you’re gaining that throw-you-back-in-your-seat power. 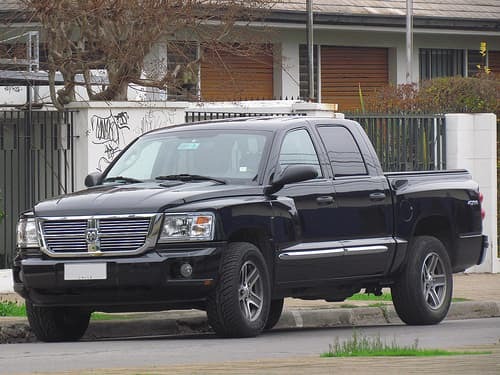 Lastly, let’s consider the mid sized Dodge Dakota which is manufactured by Chrysler and is considered a . The major gain with the smaller size of this truck is the bonus of better fuel economy. The Dodge Dakota receives an advertised 18.5 miles to the gallon for city driving. While you lose out on power and hauling ability, you gain an increase in your wallet size when changing from the F150 or Silverado to the Dakota however you may not get as good of a resale value.